Our office leverages the latest, cutting-edge technology to provide patients lasting results with minimal discomfort. Cone Beam CT technology is the most advanced technology and accurate diagnostics in dental treatment planning today. While it is similar in some ways to the regular hospital CT machines and X-Ray units, it is designed extremely accurate dental procedures. Cone Beam allows Dr. Vazquez the ability to view detailed structures inside the mouth, as well as, bone, nerves and sinuses in three dimensions with no surgery involved. It allows for the best and most accurate surgical planning meaning a faster and more successful outcome for you. Similar to an X-ray, CT can capture images of your tissue and bones. But with X-ray, you are limited to single pictures without depth. Now imagine hundreds or thousands of pictures put together like a 3D puzzle. This is a basic way to understand how this amazing technology works. Because the CT rotates around a patient’s head the unit can record hundreds of views of the head in a matter of a few seconds. Specialized software puts the images together on a computer. Dr. Vazquez can manipulate and look at any area covered by the scan and the patient will never feel any discomfort or even have to be present. How Does Dr. Vazquez use CT? Dental Implants: A customized treatment plan can be put together to determine exactly where your dental implant is best positioned before you ever sit in the chair. This is important as many structures in the jawbone need to be avoided like nerves and sinuses in the maxilla. Diagnosis: Tumors or other growths can be detected by the CT unit. Bone Grafting: By knowing the exact dimensions of every area of the jaw, Dr. Vazquez can determine the best grafting technique to utilize. X-Nav: A Cone Beam is required for the X-Nav and X-Guide technologies, which you can read more on below. No implant should ever be placed without the aid of a Cone Beam CT. That would be like a airline pilot flying blind in a storm. Dr. Vazquez invests in technology and education to give his patients the most predictable, pain free outcomes achievable in dentistry today. While CBCT offer some radiation, it is massively reduced than any other diagnostic technologies used today and is comparable to the radiation in a short airplane flight. The very small risk is dwarfed by the massive benefits you receive from a better and more accurate diagnosis and treatment. A medical technology called X-Nav has developed a new system and software called the X-Guide which allows us to place dental implants. It uses 3D navigation in real time to help us place the implants even more precisely. This technology is also used by neurosurgeons and other medical professionals to provide a more advanced and efficient experience for surgeons and patients alike. X-Nav Technologies boasts “turn-by-turn guidance” in which Dr. Vazquez can watch the position, angle and depth of the implant as changes are made during placement. This new technology, offers live, 360 degree views of both the patient’s anatomy and the implant drill’s location at the same time. The color tracking feature gives us immediate feedback on the drill’s depth during surgery. 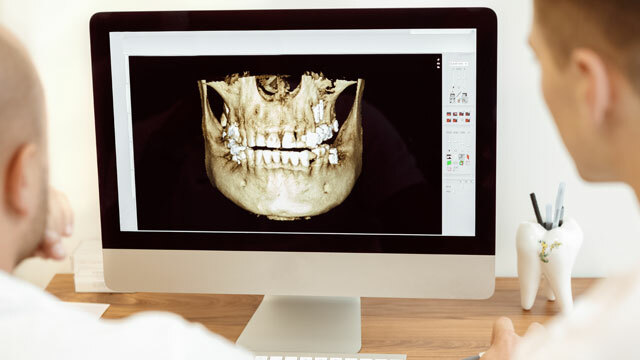 Using the planning software, the X-Guide enables us to take each individual patient’s 3D treatment plan from screen to reality with ease and confidence.